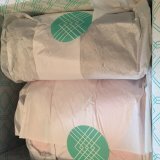 The arrival of a Stitch Fix is always like Christmas; I get so excited to see my package – and its mysterious fashion contents – waiting for me on my doorstep. This Fix was also well-timed, showing up right when I needed it to pick me up after a long day at work. I am not sure if I brought on bad karma by only keeping one piece from Fix #6, but let me tell you, #7 is really giving me pause. I might need to break up with Stitch Fix. For this Fix, I mentioned that I would be traveling to Alaska next month. I didn’t make requests for specific pieces, but somehow I envisioned things like a jacket, a cute-but-cozy scarf, a plaid shirt and maybe a sweater or two. A decent dress suitable for low temps would also have been quite nice. But if you don’t ask, you probably won’t get, so shame on me for messing that part up. There were two bundles in the box (seen in top pic). This tote bag was in one of them. When I first saw that I got a bag, I was really excited. I wanted to bring a backpack to Alaska to use on day trips, and – wishful thinking – at first I thought this was a backpack. It wasn’t. Now, in general, I am verrrry susceptible to a great tote bag, so much so that I have a zillion and really don’t need another, unless it’s spectacular. 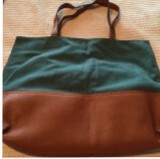 This Street Level Huron Mixed-Material Reversible Tote is made of canvas and vegan leather. Stitch Fix listed it as $48, which seems in keeping with pricing from around the web. This also seems to be pretty popular on Stitch Fix sites. Although mine is teal and brown, there’s a wide color palette available. 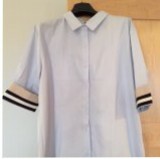 The first item was a Renee C Livett button down top. The major problem with this shirt is that it is incredibly boxy. 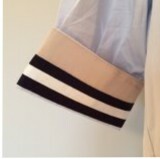 It’s about 6 inches longer than a regular button down and about 10 times wider. I’m really not sure what could save this look. What you can’t see is that this jacket is incredibly wrinkly. I’m not sure what I think about that, since it’s unlikely I would iron it. Ever. I’d just have to wear it in its wrinkly glory. The jacket is lightweight and overall it’s a pretty cute piece; honestly, this is the kind of thing I thought I would get in an Alaska box. Except this: I already have a J. 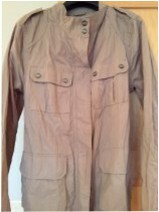 Crew Downtown Field Jacket that I love and even got for a better price than this piece (listed by Stitch Fix at $128). I was already planning to take the J. Crew jacket with me, so this feels redundant. 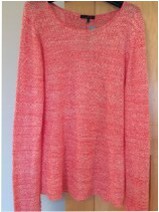 Next up: a Tart Vianna Waffle Knit Sweater in Coral. This sweater is ok all around. Color = ok. Fit = ok. Comfort = ok. I’m just not sure I like it more than ok. The last item was a pair of Just Black skinny jeans, which were also described as an exclusive to Stitch Fix. These didn’t seem like they’d photograph well, so I didn’t try to even capture them. Basically, they are styled like jeans with pockets and a zipper but made out of jegging material. When I tried them on, the dye was so saturated that they stained my foot simply from putting it through the leg. I’m not sure what that forebodes for laundering. The fit was ok; while not excessively flattering, they were sized correctly. My excitement over the box progressively waned as I tried on each item. I started with the super-saturated black jeans and the Renee C blouse. I really can’t tell if the boxy-ness of the blouse is meant to be a fashion statement, or if the fit is just terrible. Isn’t that weird? I immediately hated the blouse and then reconsidered it with the pants. Neither piece would look good on their own; the top is too wide and the pants are too narrow (at least for me). But together, they kind of balanced each other out, and I actually appreciated the length in the shirt over such slim pants. 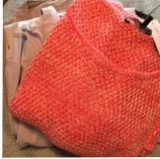 The next thing I did was to layer the coral sweater over the shirt, then top it all with the jacket. Putting all of the pieces together, this box made a decent outfit, albeit one I wouldn’t have selected on my own. The clock is ticking for my window to return items I don’t want, which is making this really hard. Keeping everything would be $267, which I am not really inclined to spend during my current state of closet editing. Of the pieces, there are three that are ok (jeans, jacket, sweater) but nothing I don’t already have; one that is simply weird in its fit (blouse), and I can’t decide if it’s weird good or weird bad; and then there is a total dud (tote bag, I’m looking at you). 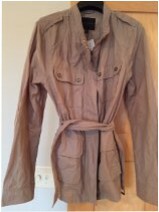 Keeping the jacket and jeans would be $128 + $78 – $20 styling fee = $186. Other mathematical permutations exist, but I’m so undecided that I can’t even select one thing that I’d pick over the others. I think this means I should send it all back and lose my $20 styling fee, but I’d welcome any thoughts. This was a disappointing Christmas. Send it all back, I think! You should love it if you are going to keep it. Thanks for your thoughts! I quickly packed it all up and stopped by the postal station on the way to work this morning, before I chickened out and kept something. I received the Livett shirt also, and I like how unique it is, but it was HUGE as a Medium, and they don’t carry any other size. I sent all of my stuff back (first time) so I am giving it another shot, then I will cancel. It is a great idea, but the prices and some of the items are way meh…especially for the money…it kills me to loose my $20, but like I said – one more chance. Loved your blog!